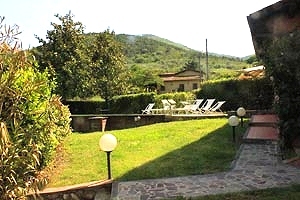 The charming villa stands on the hills east of Lucca, just a few kilometres from the "town of the hundred churches" and the beaches of Versilia. 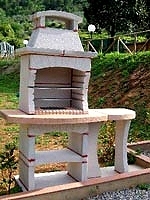 Other important Tuscan cities of art, such as Pisa and Florence, are easily reached by car. 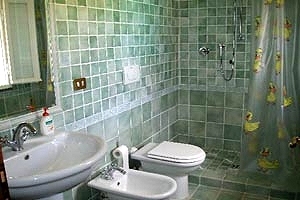 The skiing resort of Abetone is within short driving distance as well. Surrounded by green hills, the 1920s building has been renovated with an eye to preserving such original elements as the joisted ceilings, the stairs in local stone, the period windows and the fireplace. 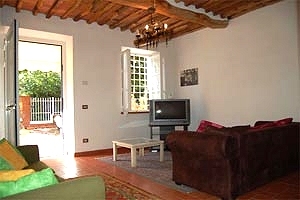 Thanks to its thick walls, the villa is warm in winter and fresh in summer. The building is surrounded by a fully fenced garden with the private swimming pool (12x6 m; depth: 1.30 m). The veranda by the poolside is equipped with sun loungers and deck chairs. Next to the swimming pool stands an outdoor shower. 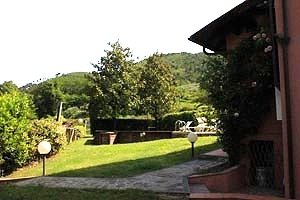 The small terrace stretching next to the villa is furnished for having meals al fresco under a large parasol. The villa is a three-storey building that sleeps 6+2 guests in 2 double bedroom, 1 twin bedroom and 1 double sofa bed, and has 2 bathrooms. The ground floor composes of kitchen, living room, storeroom and a bathroom. 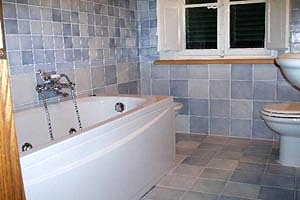 On the first floor are a double bedroom, a twin bedroom and a bathroom with whirlpool bathtub. 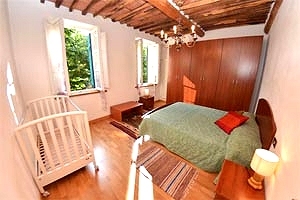 The second floor consists of a double bedroom and a mansard room with a double sofa bed. 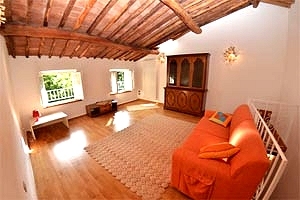 The second floor overlooks the wonderful surrounding hills and the plain of Lucca. 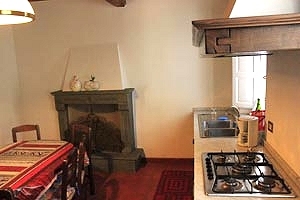 The villa is equipped with swimming pool, outdoor shower, barbecue, working fireplace, satellite TV, stereo system, Internet connection, oven, microwave oven, fridge with freezer, dishwasher, whirlpool bathtub, washing machine, ironing equipment, cot bed and private parking place for four cars. Four bicycles are at guests' disposal. A cook and a domestic help are available upon request. Shops and services of any kind are 800 metres from the villa. A tennis club is 2 kilometres from the property. Lucca 15 km - Pisa 35 km - Florence 70 km - Siena 135 km - Arezzo 145. Pisa airport 45 km - Florence airport 65 km. The villa is easily accessed through paved roads. Propriétaire très sympathique, juste un petit soucis avec le nettoyage de la piscine que nous avons dû faire nous même, car le propriétaire était très occupé par son travail. Sinon maison très jolie et spacieuse. Nous avons passés d'excellentes vacances.